The Parkzone T-28 Trojan. Of all the Parkzone RC airplanes this is the one I really like! This model has been around for quite a while now. It was initially offered in the red and white color scheme of the US Navy, but the latest versions are in the blue and white colors of the US Air Force. The fact that the Parkzone T-28 is so popular is because it is such a good flyer! With its tricycle landing gear and low wing it looks like a menacing WW2 warbird. 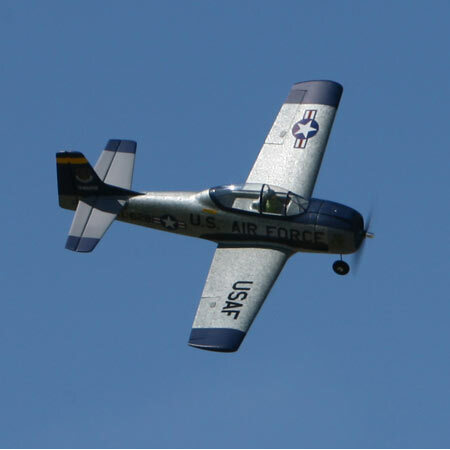 However the full size T-28 Trojan was first used in the 50's and served as a piston powered primary trainer. The one feature I do like, of this model, is that all of the onboard components are totally re-usable on other projects. I will go into more detail further down the page. Although this Parkzone RC is easy to fly, I would not recommend it as your first RC airplane. If you do have an experienced flyer to help, it could be possible. With a wing span of 44" and a total weight of 31 oz. this model could be flown in your local park. However, you will need a smooth surface to take off and land on. The nose wheel is steerable and is not easily removed. Both versions (BNF and PNP) are manufactured from Parkzone's Z-foam and require just the basic assembly. The Wing needs to be bolted on, the landing gear installed and the horizontal stab inserted and taped. Parkzone say to charge the battery when you are doing this assembly work. I am sure you will be finished long before the battery is charged! This version of the T-28 Trojan comes without a receiver, lipo battery or charger. It does come with 4 servos installed and the outrunner brushless motor and brushless 30 amp ESC already assembled. This version of the Parkzone T-28 comes complete with a receiver, lipo battery and charger and the servos are installed. Also installed is the brushless motor and the 30 amp RC ESC. The only extra item required is a 4-channel RC transmitter. Take a look at the video to see how well the Parkzone T-28 flies. The photo shows the Spektrum DX6i. This 6-channel transmitter is a real bargain. 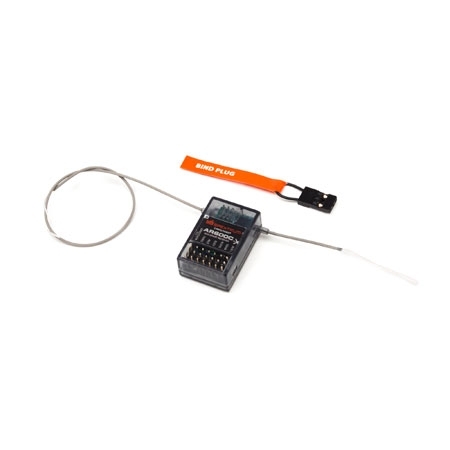 This is an excellent 2.4 Ghz computer transmitter that is compatible with the Parkzone T-28 receiver. Here we see a photo of the receiver, built in to the BNF version of the T-28 but NOT included in the PNP model. This is the Spektrum AR 600 DSMX 6 channel sport receiver. 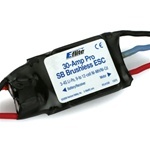 This unit is the E-Flite 30 amp Pro Switch, BEC brushless RC ESC. This unit is mounted in the T-28 Trojan. It can also be used in future projects. It can handle up to 30 amps of continuous current, as long as cooling airflow is allowed to keep the unit from overheating. 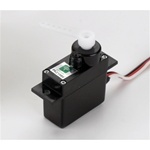 The unit can drive up to 5 analog or 4 digital sub-micro RC servos. Voltage cut-of is one of the many programmable features. Either a 3S (11.1V) or a 4S (14.8V) lipo battery can be used. Note that this unit is included in both PNP and BNF versions and is listed here for reference only. 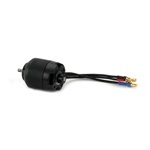 The Parkzone T-28 comes with a factory installed outrunner brushless motor. This is a 480 size unit with a KV rating of 960.Note that this unit is included in both PNP and BNF versions and is listed here for reference only. 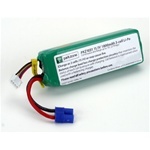 Here we have the 11.1v 1800mAh lipo battery. This battery should give you 8-9 minutes of flight time, as long as you spend some time at a lower throttle setting. The battery is included in the BNF version but is NOT in the PNP. 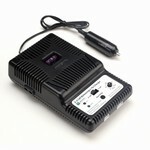 Now you will need a lipo charger,( If you purchased the PNP version) similar to the one in the photo. This unit is included in the BNF model and does feature balanced charging. This feature ensures that all cells are charged equally and reduces the risk of fire, that was a possibility with early lipo chargers. The charger requires a 12V supply and comes with a cigarette lighter adaptor. You can plug this into your car and recharge as many times as you like! Please note that all the servos are included with both the PNP and BNF versions and are included here for reference only! There are 3-types of RC servos used in the Parkzone T-28. The photo shows the elevator servo. The aileron servos are the SV-80 and there are two of them. The final servo type is the DSV130M. This is used on the rudder and nose wheel and is a metal geared servo. Bare in mind that neither the PNP or the BNF version includes an RC transmitter. The PNP does NOT include a battery, charger or a receiver but does include all 4 servos. Either version does give you a very nice flying scale RC plane. It can be easy to fly and if high rates are used it can perform all of the scale like maneuvers. Scale: Approx 1/11 full size. Motor installed: 480 960Kv outrunner brushless motor. 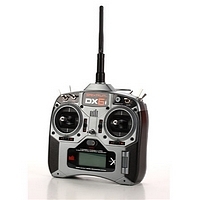 Radio req'd: 4-channel DSM2 or DSMX, 2,4 Ghz. Approx. Flying Time: .10-12 minutes.